Happy Friday! How was your week? I have to admit the weather in Minneapolis has been getting me down a bit. It’s been rainy and gray everyday this week. It’s been taking a toll on my mood. But in the spirit of this reminder…. Love the sound of this vegan and gluten-free Lemon and Blackberry Crumble Cake from Fork and Beans. Lemon and any fruit is such a summery combo. I’d love to make this for a summer picnic or cookout! This is the latest in government-sponsored fat-shaming ads that target young children. They claim it’s in an effort to promote “healthy” eating habits, but at the end of the day, ads like this and this are ultimately designed to sell products and perpetuate fat-phobia. And I don’t think I have to tell my mostly vegan readership that milk is not necessarily a healthy beverage. Read more at Jezebel for some witty outrage. According to VegNews, Canada is drafting a law that will make it illegal to put pregnant momma pigs in gestation crates. Way to go, Canada! I’ve been craving burritos for some reason (perhaps because I haven’t had a burrito in at least a year, probably longer! ), so I did some Pinteresting to bookmark a recipe. I was happy to find The Almost Vegan’s quick and simple recipe for sweet potato burritos. Must make! phone calls with friends who understand. Have you been craving any foods lately? What do you think about those milk ads? What made you happy this week? Glad you enjoyed the burritos!! Thanks for the mention! Thanks for the great (simple!) recipe! 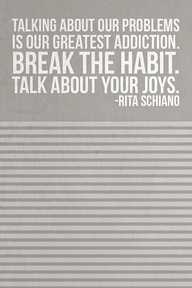 i love the idea of talking about joy! Just bookmarked the burritos (great idea making quinoa in the salsa!) and reserved that book too – I loved Wild! One awesome thing about this week I that I started eating greens for breakfast – steamed with acv – it’s really helped pull me out of a rut of bad eating habits! The tip came from “Chef AJ”…. I just read an excerpt from that book, and now I want to read it, too! I love all the stuff that makes you happy! ….except for the Wire, but that’s only because I haven’t watched it yet- need to get on that! I’ve heard Tiny Beautiful Things is great. I’m reading Homeward Bound, about New Domesticity. I think I wanna write a piece on it once I finish. it’s very interesting. The Blackberry lemon crumble sounds amaaaaazing. I LOVE blackberries -I’m getting a blackberry tattoo next month (in season!) and any berries are so delicious in baked goods. If I can be bothered to turn on the oven in the summer, I’ll totally make it. I’ve been wanting to read Homeward Bound! Please do write a piece about it! I’ve been meaning to make a “Summer Book List” post so I could get suggestions to add to my list, but I’m glad I’m getting ideas anyway. I would highly recommend Tiny Beautiful Things. I am feeling all the feelings. I agree! I love her approach to life too. Her reflections on presence and pain and love are always very poignant. I’m glad you’re enjoying a pumpkin-y fall! There’s just something about sun and warm days that scream “burrito”! Fajitas too for that matter! The milk campaign is upsetting for many reasons, not least of which is the fact that milk can cause a whole host of health issues, as you well know. The day that main-steam nutritional science gets on board with that, the better. A professor from the Harvard School of Public health came to Cornell and spoke about the dearth of science indicating that milk protects against osteoporosis, and he was practically run out of town by an angry mob with torches! But yeah, I’m fairly certain there is little to no evidence suggesting that fat shaming leads to a decrease in childhood obesity. I’m willing to bet that it could have the opposite effect, and perpetuate disordered eating though by further ostracising fat children into social isolation . Nice going, government! Oh my goodness that story about the Harvard professor is so interesting. People are so married to the idea that milk is good. Ugh! And, yeah, #governmentfail again.